Jizuya Hazuya chips and Nugui (Kanahada) and another Nugui powder (selection), are pro quality stones, directly imported from Japan. Usage: Generally, using sandpaper (#120 - #150) to make the flat face of chips in orde to polish blade evenly; then, directly use lightly pressing by a finger, or glue on rice paper. Jizuya Hazuya chips and Nugui (Kanahada) and another Nugui powder (selection), are pro quality stones, directly imported from Japan. Set content: Jizuya and Hazuya chips are approx. 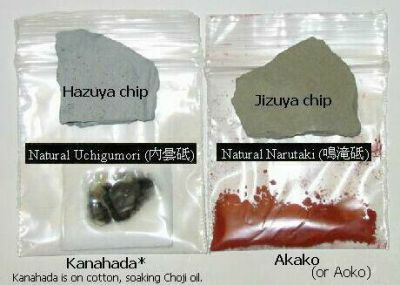 10g each (one or two chips each) ; Kanahada is on cotton soaking Choji oil; Akako or Aoko powder is 1g. Jizuya is polishing for Ji, Hazuya is for Ha. Nugui is used for mixing with Choji oil. Kanahada powder for softer kanahada blade (older), to enhance temper line and quality taste (older shibumi) of blade, just like cosmetics.